The core objective of Lean is creating more value for customers while optimizing resources. It sounds simple, but it is truly effective. Companies widely recognize that to achieve and sustain competitive advantage, they must become more customer-focused. This is why many organizations turn to Lean. The Lean thinking begins with one simple thing: identifying value. This will help you understand what your customers are ready to pay for. Respectively, your organization will be able to build a value stream where you can identify wasteful activities and remove them from your workflow. By doing so, you will be able to deliver the value that customers expect and optimize profitability. Lean management is a philosophy that has gained massive popularity in various industries, because of its positive impact on any company’s’ overall performance. It supports organizations in many aspects like: reducing costs, optimizing processes, improving quality and etc. However, what really makes Lean effective is the focus on value. In terms of Lean, value should always be considered from a customer perspective. At the end of the day, it doesn’t matter whether you came up with a great idea if the customer doesn’t see any value and she is not ready to pay for your great idea. It is important to remember that customers enjoy value in its entirety but not delivered piece by piece. It is tricky, but if you don’t pay attention to this, you may end up with a bunch of unhappy customers and low brand equity. Here is an example. Imagine that you buy a laptop. You had your laptop delivered and when you try to run it, you realize that the machine is without an operating system. So now you need to buy the operating system and install it. Let’s assume you don’t have the knowledge to do this. It means you have to find a specialist who can make your laptop actually running. Both things will cost you money and time. In the end, you will have a working laptop after a week (if you have luck) and you will probably never buy a device from this company again. This example can give you a different perspective on value. You didn’t just need a laptop. You needed a laptop that you can use immediately, so you can do some work, play video games, play some music and so on. 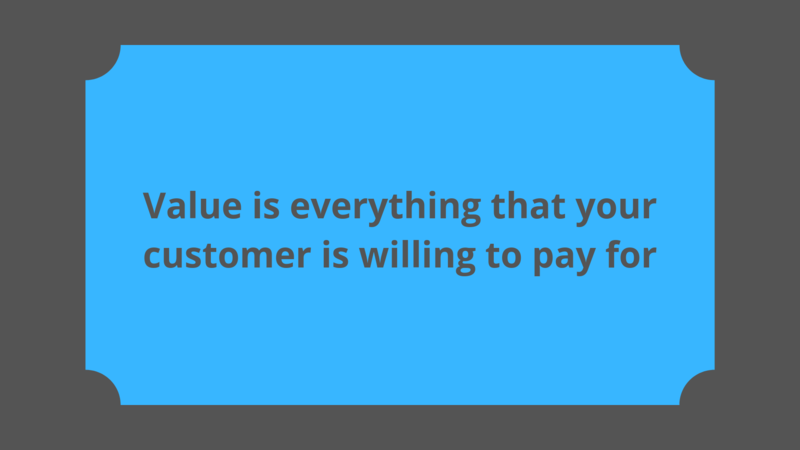 In the end, value is what customers really want, along with the price they are willing to pay. When you figure this out, you can start mapping the work process and focus on recognizing value adding activities and waste activities. After this, do whatever you need to maximize the first and minimize the last so you can meet your customers expectations. When you have your processes mapped, you will be able to recognize which activities add value to the end product and which ones are waste. Taiichi Ohno, who is considered as the main architect of Toyota Production System devoted his career to eliminating waste (Muda) from production processes. He probably realized this is the right way to generate value for the customer. Ohno was able to identify various activities in different work processes, which can be removed. You can easily remember them as TIMWOOD. In the following table, you can acquire a better understanding of how these seven types of waste can be visualized and applied to the production processes in manufacturing, software development, and marketing. This is just a sample of what waste activities may be in different areas. Companies know their processes at best, so better sit down and examine your own workflow. However, it is also important to differentiate necessary waste from pure waste. For example, testing a software is a non-value adding activity, but it is literally impossible to produce a software without testing (at least if you don’t want to bankrupt really fast). Imagine that you have to buy a self-driven car whose software was never tested. You will probably prefer to cycle or walk. Pure waste – any activity that doesn’t bring value and damages efficiency. Usually, waiting is the most common type of pure waste. Necessary waste – activities that our customers have no interest paying for, but they are required to maximize the value of the end product. Such activities can be testing, planning and etc. Value – the definition of value in lean is everything the customer is willing to to pay for. If you take a look around, you will probably notice a lot of waste activities in your work processes. Lots of meetings where no decisions are made, a bunch of customer requests (complaints) waiting on your manager’s approval and so on. At the end of the day customers don’t care about your waste activities. The only thing they care about is what value you can offer them. So, you better inspect your work processes and try to eliminate waste at maximum. However, sometimes even customers cannot define the value in its entirety. In these cases the most progressive ones succeed to stand out from the crowd and add value that nobody has seen before. Because sometimes people do not know if they need something until they see it. Just remember that no one ever knew what is the PC or smartphone. There are many different tools you can use in order to improve your work processes. Each of them can help you find value as well as to detect waste. 5 whys – a simple technique for solving problems. It can help you find the root cause of any problem and identify good opportunities for improvements. A3 problem-solving – a model that also supports you in finding root causes in your workflow. It encourages collaboration and cross-organizational knowledge sharing that often helps you identify value-adding activities or wasteful ones. Gemba walk – a technique that gives higher management an opportunity to go and see where the real work happens. An excellent opportunity to build stable relationships with those who do the actual work and see where value is created. Identify value-adding and non-value adding activities. Detect and eliminate pure waste and necessary waste activities. Focus on optimizing processes and profitability.